A bar in Juneau claims it has a pistol that belonged to one of history’s most notorious gunslingers. But does the story check out? By the turn of the century, he was already a celebrity of sorts. That about when when Wyatt Earp and his wife Josephine traveled to Nome at the height of the gold rush to start a saloon. Legend has it Earp briefly passed through the gold mining town of Juneau. And left something valuable behind: a Smith & Wesson No. 3 revolver that to this day is a kitschy tourist attraction in a downtown bar. Eric Forst owns the modern-day Red Dog Saloon where the pistol’s been a fixture for decades. “So the story that I got… back in the early 1900s, early teens or ’20s. The gun was part of what was then this Territorial Museum,” Forst said. Forst said the story is that a museum employee – or at least someone with access to its treasures – had a bit of a drinking habit. The Territorial Museum would later become the Alaska State Museum. Steve Henrikson, curator of collections humored my question. “I can’t rule anything out but I have been through the records pretty thoroughly over the last 30 years and I’ve never seen it listed either as something that belonged to the museum or as a loan,” Henrikson said. There’s something else that doesn’t add up. The Seattle Post-Intelligencer reported on May 20, 1900 that Wyatt Earp and his wife set sail on the S.S. Alliance to return to Alaska. Back then, Nome-bound steamships mostly transited through Unalaska in the Aleutians on their way to Cape Nome. I asked state archivist Zachary Jones if there’s any record of Wyatt Earp passing through Juneau. Not only is it questionable the pistol belonged to Wyatt Earp. Now there’s doubt he was even ever here. I didn’t find timetables. But there’s a trove of old newspapers on microfilm in the state archives. I thumbed through Juneau’s Daily Alaska Dispatch. I had a date and the name of the steamship: the sign on the wall said he’d been disarmed on June 27, 1900. He supposedly sailed two days later on the S.S. Senator. Juneau’s newspapers around that time are full of news about miners heading to Nome. And ads for Rainier beer. But there’s nothing about Wyatt Earp or that ship. But I was looking in the wrong place. There’s an item in the Nome Daily News reporting on Wyatt Earp’s arrest in a drunken brawl. It’s dated June 29, 1900 – the day he supposedly left his gun in Juneau. So there’s a hole in the story right there. But just because the dates are wrong doesn’t mean the whole story’s bunk. But it probably is. 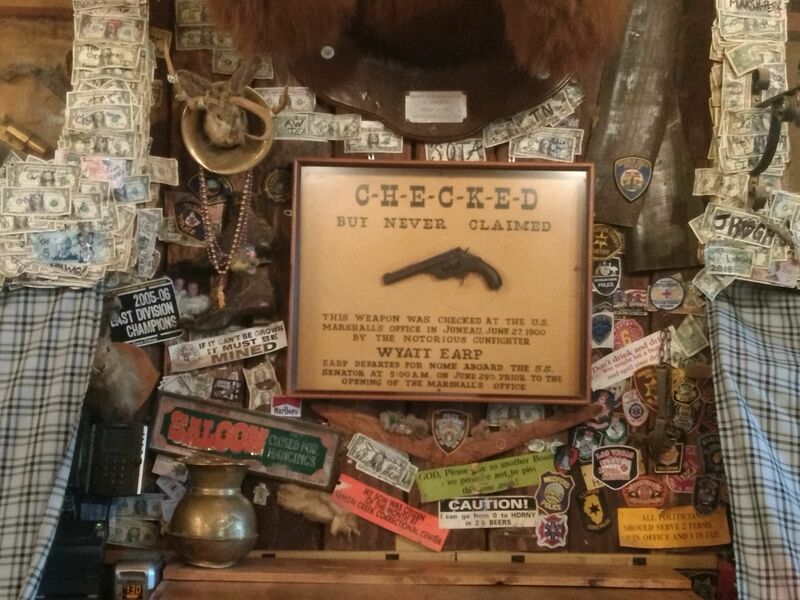 From the get-go, bar owner Eric Forst said he bought the saloon but not necessarily the legend around Wyatt Earp’s pistol.